An appealing design is often referred to the balanced composition of some tiniest details. Such details can result into a bagful of issues for the newbie designers. Failing to work in accordance with the most critical rules can spoil any landing page, giving your brand an unprofessional look that will ultimately cost you conversions. Luckily, there are some simple tricks that you can use for improving your web design prior launching your business’s website. You know some designs look nice, but tend to fail in winning visitor’s interest and could end up transforming them into customers. You might not know that 90-95% of a design’s success is determined by its typography. So, it is very important to be more concise here. It is preferable to use two fonts for differentiating headings and body text, narrow columns’ and a line height of 1.6 for body text. And for making columns more scannable, you should create a line with 58 characters each. Professionals say that you should pick only two colors for your design and assign each one a job. 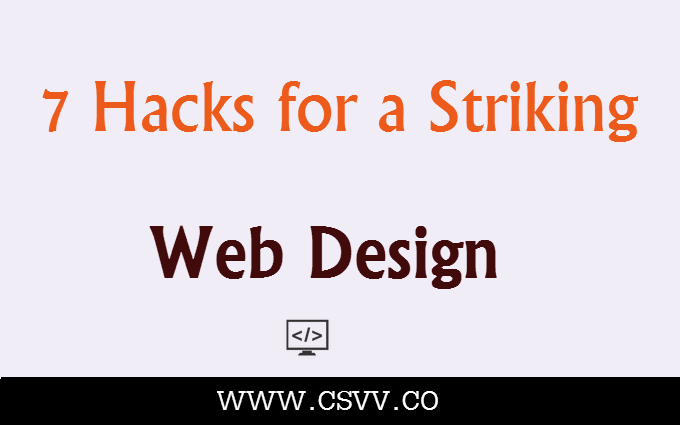 For instance, you may use violet for call-to-actions and black for elements of branding. More importantly, make sure you are using the exact same set of colors in the entire website – don’t ever let your feeling decide the colors as they will appear completely different on different sized screens. Sass variables and a color picker will do. Till the time you are not copying the entire website, you are free to use the navigation of one website while having footer functionalities from another. As a matter of fact, many of the websites today use similar patterns that make interface quite easy to use. By using this technique, you will gain some extra time to think about its adaptability and personalize the design instead of fibbing it. Keeping hierarchy in line will prove to be beneficial for your design in the long term. But this concept may sound a bit complicated for your designs. One simple way out is listing all the elements and sort them as per the importance. Then just follow the sorted list and highlight the most important element with big font and contrasting colors. If your website’s layout is not looking quite right, it might be lacking the macro white-space. The most practical trick here is to leave more space between the elements than you normally think is appropriate. Remember, white space is not merely a blank area; it’s a graphical tool. Want to add a quick illustration? Get icons to save your life. You can use them for designing simple logos as well. Icons give an additional edge to the informative design. Try using tiny icons in place of stats in the list and see the difference it makes to the overall appearance. It often sounds like a nightmare when you need to work with a number of photos especially when their alignment varies. A wonderful solution to this problem is to arrange them all in a plain grid layout and you will see a noteworthy improvement in the overall presentation of the photos. Hope these tricks will help you transform your OK looking designs into Great ones. Apart from the ones listed above, feel free to share the ones you have used for giving your design an exceptional look. Kristy Bernales is an experienced designing professional working with WDX – website design Melbourne Studio. She strives to bring forth the best tricks for the fellow designers, making their work routine more efficient.